The new 4.5in X-Series N3 features a transfer case drop kit, forged adjustable track bar, stainless steel brake lines, and sway-bar disconnects. A set lifted coil springs and all-new rear lifted leaf springs help your XJ gain a total of 4.5in in lift - plenty of clearance for 32in tires. 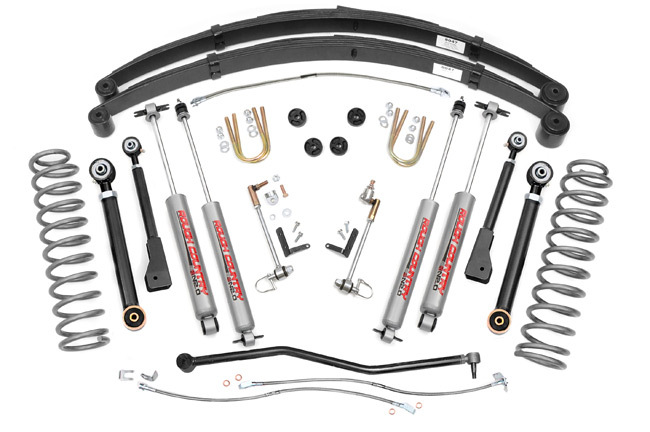 This X-Series kit features Rough Country's X-Flex Control arms in the front upper and lower position. X-Flex Arms are fully adjustable, and feature a ball-in joint, massive 2.5in diameter body, and huge 1.25in threads. X-Flex Control Arm Joints have long offered considerable range, strength, and safety for off-road applications - but it doesn't stop there. X-Flex Joints now feature Adjustable Retainer Rings, allowing you to preload the bushings by compressing them prior to install. These NEW bushings are fitted with interlocking grooves that completely encase the ball joint for a firm grip. Made of high-quality 88 Durometer Urethane, these bushings retain the memory of their original shape, are weather resistant, and offer a much longer lifespan. Improve your on and off-road ride quality with Rough Country's premium N3 shocks! These 10-stage variable valving, high-pressure Nitrogen charged shocks offer a fantastic blend of off-road action and smooth highway ride quality. With a durable 18mm spring-loaded piston rod and faster-cooling 54mm shock body, this shock offers up to 36kN Tensile Strength for a long lifespan of impressive vibration dampening. So if you're looking for longevity and an uncompromised ride, look no further. Rough Country's X-Series N3 features the best of the best in off-road hardware. Front: Lifted coil springs, upper and lower adjustable X-Flex control arms, transfer case drop kit, adjustable track bar, stainless steel brake lines, and sway-bar disconnects. Rear: Lifted leaf springs, u-bolts, and stainless steel brake line. Shocks: Kit includes (4) N3 series shocks. New quick disconnects quickly and easily store out of the way when not in use.